I have decided to try it with a second one. 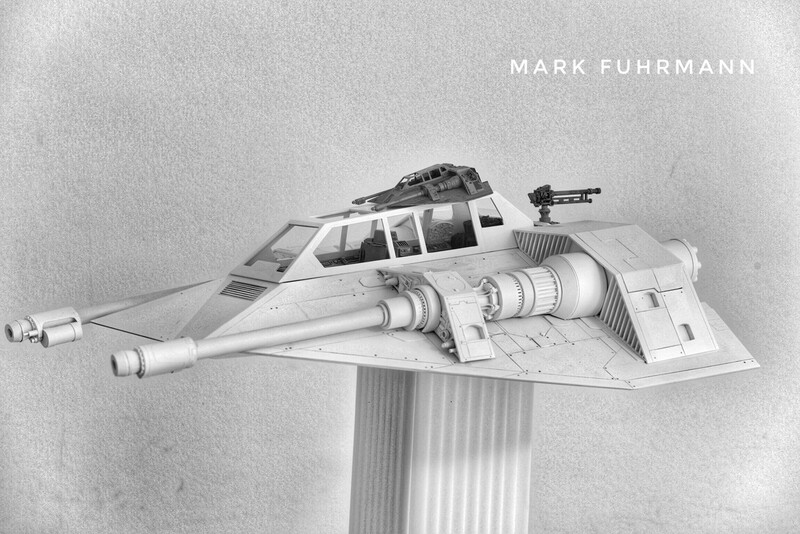 A studio scale Snowspeeder 1:10 scale. This project has been a big challange for me as this whole modelling still feels new to me. In advance sorry for not posting the progress of my work for the past 14 month. I wasn't convinced that I could build this model and did not want to post pictures of something what ends in a chaos. The Snowspeeder is one of my favorite models from Star Wars. Another reason for building it was that I thought that I won't need to vacuum form any parts and could build all parts somehow pretty easy. At the end it wasn´t so easy, for me very complicated and much harder than the Turbolaser diorama. The main issue was that the Turbolaser gave me some freedom to build it in scale, the Snowspeeder not. If there is anything out of scale or shape you see it immediately and it doesn't look good. I have bought a Bandai Snowspeeder 1:48 and upscaled it as good as possible. I have also used all pictures which I could find online. I wanted to build a big 1:10 studio scale model, like what they have used in the film. The model is about 55 cm long, completely scratchbuild from styrene parts and building time is 6 month until now. I started it 14 month ago but meanwhile I took an 8 month break from the build as I didn‘t want to see it anymore. Many parts needed to be build twice because I made mistakes. Now as the model is very advanced I wanted to show it here in this forum first. It is still not finished, some things are still to do and it also need to be painted. This will happen during this year I hope. Please find attached some pictures of my model. Almost all parts except the fuselage are not glued yet because I want to paint the fuselage first. All other parts are fixed with tape for the pictures which looks not perfect but good enough to get an impression I think. I hope you like the pictures of my Snowspeeder. That's an outstanding piece of work Mark. The level of detailing you've got in the guns and engine areas is amazing. Very much looking forward to seeing the painting stages. Many thanks Andy, this is very kind of you. I am also looking forward to see it painted and I don‘t want to hurry with that. I really would need your painting skills now! The first set o pictures were mind blowing but that last one of the engine detail is the dogs dangly bits!! many thanks for your kind words! Good to hear that it was worth the work. Very much worth all the work. Thanks a lot, this is great to hear! I saw this and thought “He’s posted the wrong pic, the Bandai one isn’t there.” Then I saw it. Amazing! Jaw-droppingly good, well done! Many thanks! I am really happy that you like it! “Like” does not come close, I cannot wait to see this painted; it’s incredible! Thanks a lot! I also can not wait to see it painted! There are few minor things to make at the model before I can paint it. I am not sure if I can do this with Tamiya spraycans or if I should use airbrush which I do not have so far. I will keep you informed! Yeah, I could not believe eve the size difference between the two kits. I wonder if scratch building is easier at that scale or does it simply bring with it a whole host of new problems? Not that I’m trying to say what you have accomplished here was easy, the amount of work that has gone into this makes me weak at the knees, I barely get a chance to build anything at the moment due to my work life intruding into my home life. That and decorating and apparently I cannot use my airbrush to paint the hall! I think that smaller as well as bigger scratchbuilds have their challenges. With smaller builds the styrene parts need to be cut more precisely and it can be more tricky to glue everything together. Sure with a bigger model the work has to be precise too. At a bigger model the details need to be bigger and therefore more precisely. I have the feeling that I need to work cleaner at a bigger model because you see easily every gap, hole or glue. Other things are easier to build when they are bigger, for example the cannon tubes of the Snowspeeder. But on the other hand they need to be more detailed to look good. I also have barely time for this hobby due to my work and my family. I started the Snowspeeder 14 month ago and there is still a lot to do with it. I will keep you informed! I could barely scratchbuild replacement u/c doors, never mind an entire model! Many thanks, this is very kind of you! Interests:sci-fi, horror and fantasy and all aspects of. that's one of the best pieces of model engineering I have ever seen. Its so precise and intricate. The subject is only mirrored by its scale in brilliance. This folks,is the reason why were inspired to do what we do.